Yesterday, I showed you a Valencian scene from centuries ago: a man fishing in the River Túria. No, the water you see isn’t the river. Cooling ponds and watercourses break up the space. Come with us now to see it as it is today. 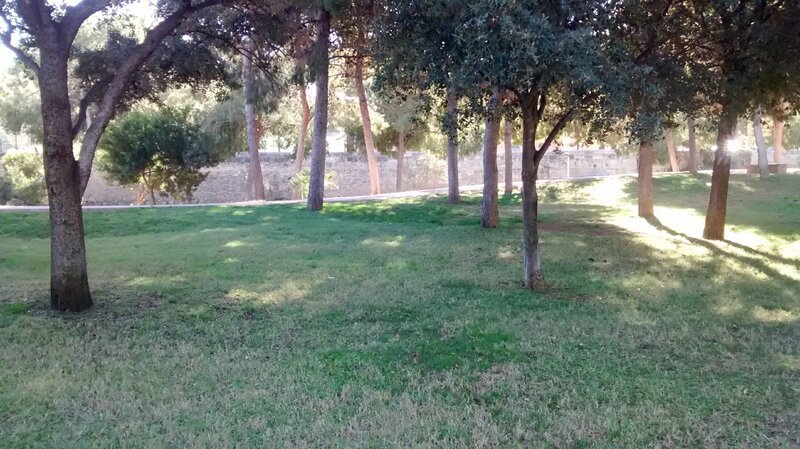 No longer a river, but a long sinuous public park wandering the northern edge of the old city centre. By 1957, the river had flooded once too often. Too many homes had been lost and livelihoods ruined. The city made the bold choice to move the river, and give the vacated space not to a road, not to housing, but to the people, as a park. At any moment of the day you’ll find commuting cyclists, dog walkers, joggers, families, elderly couples, sporty types – all enjoying this 9 km. long space. Today, we were there too, walking under ancient 15th century bridges, through cool wooded glades, all the way to the Ciutat de les Arts i les Ciències, Valencia’s iconic futuristic cultural and leisure centre. So this is part two of my contribution to Saturday’s Ragtag Challenge: and no river in sight. Once upon a time, perhaps every fifty years, Valencia used to be engulfed by floods. The River Túria, which largely encircled the old city centre, regularly burst its banks and devastated the town. 1957 was particularly bad. The streets became canals, houses were ruined, and more than eighty people died. Something had to be done. The solution was radical. They moved the river. The Túria now flows well south of the city and those floods are all in the past. But what to do with the old river bed? Well, what about a multi-lane superhighway charging through the city, linking Madrid with the port of Valencia? It jolly nearly happened. But the citizens, horrified, had a better idea than the planners. What about a park? The plan took many years to realise – there’s little commercial advantage in green space. But eventually work began on preparing the site, and later on planning and planting. 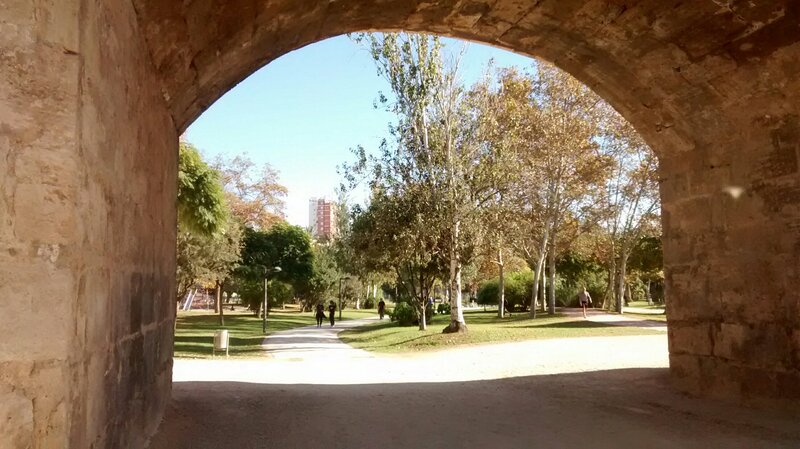 Now the Túria Gardens are much loved, much used. If you want to go jogging, ride your bike, walk the dog, play sport, bring the children to let off steam or have a picnic, you have a nine kilometre (soon to be eleven) circuit to play with. It’s an idyllic, peaceful place at any time of day. How do I know all this? Because I went on a Free Tour Valencia yesterday. For ‘free’, read ‘pay as you like’. This company has good, informative and interesting guides. They have to be good, or they wouldn’t earn anything. If you go to Valencia, be sure to seek them out. Thanks, Carlos. I hope I’ve got my facts right. 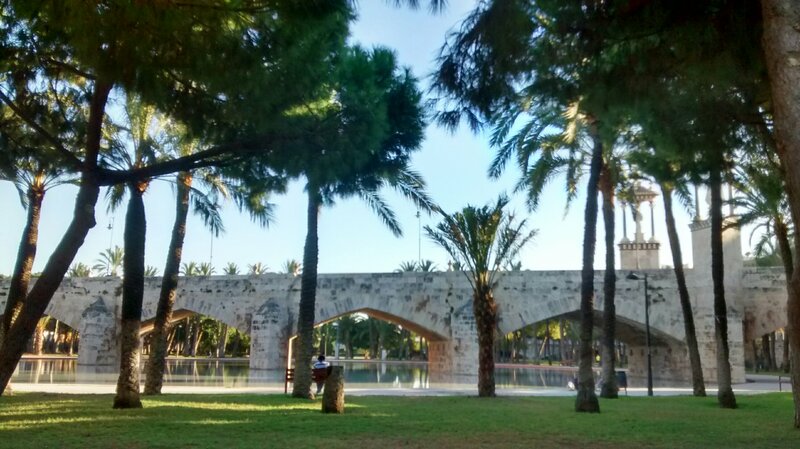 The gardens seen through an arch of the 17th century bridge of Sant Josep.